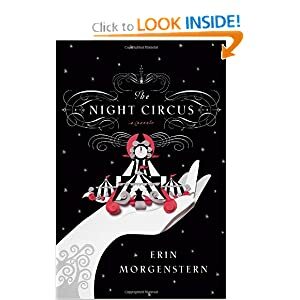 This month we read The Night Circus by Erin Morgenstern for my book club. I can't say enough about what a beautiful book it was. It's written in a non chronological order of events, and yet you get the complete story. The characters were colorful and I developed a bond with each and every one. Even the character I didn't quite like still managed to move me by the end of the story. If you are a fan of the circus and of odd things, then this book is for you. I could totally see it done in a Tim Burton movie, at least, that's how I saw the story in my head.